We've gone Hairspray daft here at Backstage Pass. We caught the superb UK tour at the King's Theatre in Glasgow this week and were lucky enough to catch up with Freya Sutton (Tracy Turnblad) and Lucy Benjamin (Velma Von Tussle) in Edinburgh ahead of the show arriving at the Edinburgh Playhouse this September. Hairspray is your professional debut, how are you finding being on tour? FS: Amazing. It’s such a high energy show. We had a week off recently and when I returned I rehearsed “Good Morning Baltimore” at the sound check and I literally got goose bumps. I was like, wow this is my job! What's the biggest challenge for a touring production? FS: It’s difficult being away from home and your home comforts. On tour you need to be able to make your self at home in your digs pretty quickly. At home you know where everything is, like the shops and stuff, but on tour you need to go and find everything out for yourself. But everyone is really supportive and we do all help each other out. Tracy is full of energy, what's your favourite scene in the show? FS: I do love the bits when she is right at the front. But that’s a lot of pressure! And I still get really nervous. But I think that’s a good thing. There are a lot of fat suits in Hairspray, how hot does it get under those lights? FS: Really, really hot! They have a bodice inside them too. You do get used to it though. 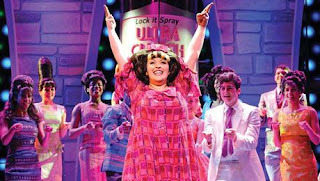 I can’t imagine doing Hairspray without the fat suit now! It’s my little home! Tracy's teenage dream was to dance on TV, was being a lead in a musical yours? FS: Yes, absolutely. It sounds like I’m making it up but when I was 17, just before I started drama school, I went to London to see Hairspray and I knew then that Tracy Turnblad was the role I wanted to play. It’s such a young role and it’s in my casting. And the story she tells is amazing, she is just a lovely person! What one piece of advice would you give to any aspiring Tracy Turnblads? FS: Work hard and put the time in. But do be yourself as that’s the most important! If you could choose any role, in any show, which would you like to be cast in next? FS: I have no idea! I’m a realistic person and Tracy is a realistic role for me to play. But after this, because of cast abilities and the amount of talent out there I may well have to be part of the ensemble in a musical. 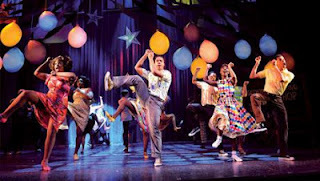 I love the musicals like Hairspray that are so upbeat and fun and they demand you to be dancing, singing and acting. I love doing all three. So another part that encompasses all three would be perfect! Your career spans stage and screen, do you prefer one to the other? LB: I can’t say I prefer one over the other because they are both so different. However I am having such a great time doing Hairspray, with each job you do there are different merits. I’ve done a lot of telly, Hairspray has got me thinking about doing more musical theatre! Velma is the villain of the piece, is it fun playing the antithesis to the nicest kids in town? LB: It’s the best part I’ve ever played! I’ve never played a baddie before and now I understand why people say once you’ve played one you never want to go back! That’s how I feel. The character I played in Eastenders was the complete opposite to Velma and I’m just having a ball playing such a villan! It’s a great part to get your teeth into. The wigs in the show are pretty spectacular, does Velma's hair take a lot of attention and is it heavy? LB:Velma’s wigs are amazing! Her finale wig is really heavy to wear. There’s also an elastic band wrapped under your head too with your hair in pin curls and my wig is pinned in to within an inch of it’s life and your head bleeds afterwards. It’s very uncomfortable and very hot. However I think it adds to the performance. When I saw the costumes and the size of the wigs I knew I had to raise my game as Velma. You’ve got to match what you’re wearing with your performance. What's your favourite number in the show? LB: It changes all the time! And I think that’s what so interesting about the show. When I first started the show I loved “You Can’t Stop the Beat” because I knew it and I loved it, then I moved on to “Without Love.”. Currently it’s “Timeless” the song that Wilbur and Edna sing. If you could play any part other than Velma for one show, which role would you like to try? LB: Amber Von Tussle! I think she gets away with being so spiky and she is so spoiled! I mean it’s similar to Velma, and for me they are my two favourite characters in the show. I have to say that because you have to empathise with the characters slightly in order to play them. Amber is a girl who has been led astray by her mother so you can kind of forgive her a bit for it, you can put the soft edges on her. Where as people can’t do that with Velma. She’s too old, she should know better than to behave the way she does. Hairspray is such a fun show to watch, do the cast have as much fun performing it? LB:The cast have an absolute ball. The joy you feel at the end of a show is incredible. And sometimes I actually feel quite emotional when I see the reaction from the audience, it’s spine tingling. And it’s not just at the end of shows you feel like that, when the overture begins the hairs on the back of your neck stand up and we are all just absolutely loving it. We are quite a bit into the tour now and no one is bored!